Did you get that close or is it zoomed in? I'm terrified of them but it looks kind of beautiful in your shot. Such great perspective with the tiny people. Love this photo! 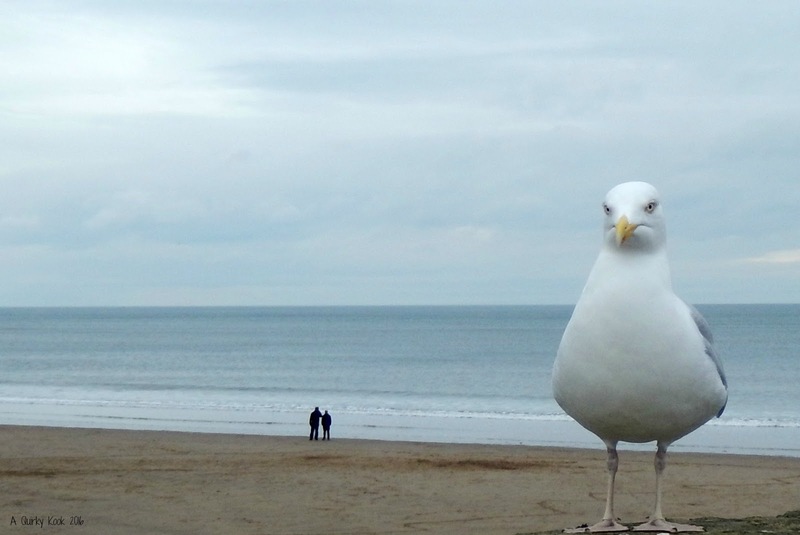 Did you set it on timer and the gull got in your shot? Or did it just walk in front of you? Either way it's fab. #MySundayPhoto Tara at After The Rain. Love the perspective on this. Really made me smile. Attack of the giant seagull. Beautiful view. Love the giant gull perspective on this. Great shot. Oh this is absolutely brilliant - Watch out for the Giant Seagull!!!! I love this! Is that a real seagull? And if so, how did you get so close to it?! What a brilliant photo, was he waiting for fish n chips from you? Brilliant photo. It reminds me of an opening scene for a film where the seagull is about to narrate a story "once upon a time..."